Welcome to Twisted Twigs on Gnarled Branches Genealogy. I'm Deidre Erin, one of the twisted twigs. 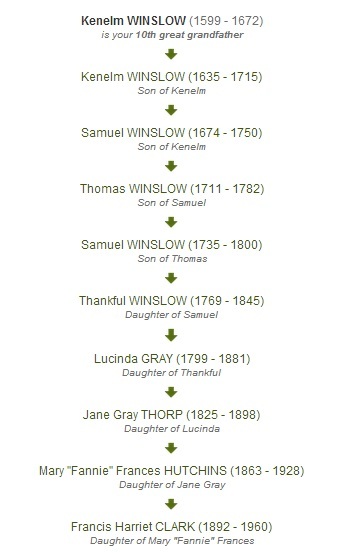 I've began researching my family tree at the inquisitive age of 12 after discovering an error on my Grandma Jayne's framed Mayflower family tree. 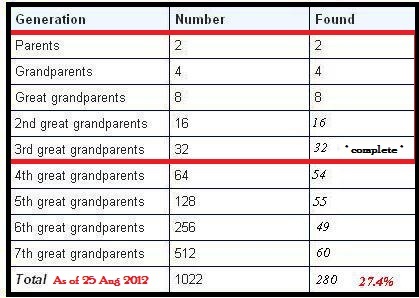 While researching my 10th Great-Grandfather, Edward Winslow, it turned out that Edward was actually a Great-Granduncle. His brother, Kenelm, was my 10th Great-Grandfather. That's where a mild interest in my family tree became the full on obsession it is today. I've been asked quite a few times why I chose the name "Twisted Twigs on Gnarled Branches". Maybe because I thought I was half Sicilian until I was 13 (Grandma Jayne remarried when my Mom was 12 and had a few more kids). 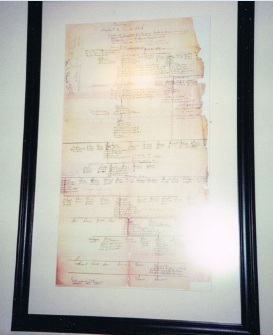 Perhaps it was the four fun filled months I spent creating a Kennedy/McDonell family tree just using St. Alphonse Roman Catholic Church records from Chapeau, Quebec. No, I didn't go off the genealogical deep end. That project (5-6 hrs a day, 7 days a week) was just to figure out which Kennedy family my orphaned 2nd Great Grandma (Kennedy) Fitzpatrick belonged to. The pay off was huge and I'm currently working on my application for United Empire Loyalists' Association of Canada (UELAC) membership. The twists and turns can be a bit overwhelming at times so there will be an accompanying clip from my Ancestry.com tree when possible. I am blessed to have had ancestors that held government positions, founded towns, came to America on well researched ships, fought in wars and applied for pensions (or their widows did). They also attended churches that protected their vital records and enjoyed being in the newspaper. Of course, there are a few that I swear were in the witness protection program even before such a program existed and quite a few black sheep that always found themselves in some sort of trouble. After 20 years of research, I am pretty pleased with my progress. Anyways, lets see what becomes of this. I'm dedicating this blog to my Mom, who drove me batty with her trips down memory lane during vacations at the family cottage. Her "when I was <insert age here>" stories were full of viable family history (dates, names, locations, etc) and all I could focus on was fishing the summer away. As I entered my teenage years, the trips to the cottage with Mom became less frequent and the stories were lost forever when Mom developed Alzheimer's in 2005. What I wouldn't give to go back to those vacations and "pay attention" as my Grandma Jayne would say. Welcome to the blogging world, you did a great job with your first post. I cannot wait to read more of your family stories and about your research. BTW, I love the name you choose! Thank you so much Terri. I know very little about blogging but I figure I'll learn as I go along. I'm pretty excited to work on my next post. Now I just have to pick a person. I'm sure I'll have plenty to share along with links & photos.. I enjoy reading blogs with photos of people and/or records.